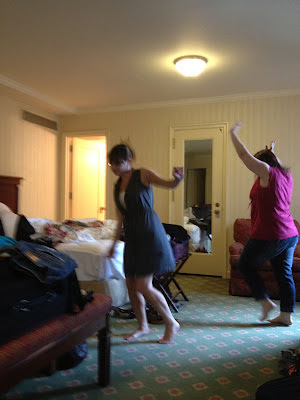 Somewhere between the time we returned to our room and left for an evening of drunken shenanigans. And yes, there were drunken shenanigans. Marianna and Steph had an impromptu dance party. I didn't want to forget this moment so I sat on the sidelines (bed) and took pictures. This is the reason in most of my pictures, I have pictures of their asses. Next time, I'm so putting the camera down and getting in on the F.U.N.! This beautiful girl was in a wedding. I had to take a picture. I have like 6 and none of them would focus. Sigh. Mmmmm cheese. It was neat how each one of us preferred a different cheese. I preferred the sharp cheddar. Don't these two look like total BFF's? Here is where all the trouble started. Stick three drunk women in a gorgeous hotel with some wicked personality and they think they are ghost hunters. Marianna wanted in? Or out? She just looked a tad crazed to me. Hello Shining! No twins for me thanks. Can we pick a different hallway? Darn it Steph, quit messing around, this really is a haunted place you know. By the way, how are you always the one to find the fairy doors? I LOVE these pics! So cute.